The American Legion Auxiliary Unit to the Andrew Blackwell Post No. 142 of Hominy, Oklahoma was formally organized on May 15, 1928, although records suggest that auxiliary activity occurred before this date. For many decades, Auxiliary members have been local leaders, playing important roles in our community. They have participated in fund raisers, and donated countless hours to various charitable projects. Unit #142 history records from 1928 through 1973, indicate a very active organization supporting our local veterans. However, waning interest during the Vietnam era, caused the local auxiliary organization to disband. No further Unit records are on file, through 2003. Then in 2004, the Unit was reactivated. At the time, there were only seven members on the membership roll. Auxiliary Unit #142 became incorporated on June 14, 2006. 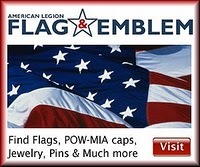 And as of 2011, we are happy to report that American Legion Auxiliary Unit 142 has 50 members. Look at us now! We have came along way, and auxiliary members are looking forward to the future as we work for our veterans, children, and communities. Won’t you join us? Visit our Membership Page. Auxiliary Unit #142 meets on the second Monday of each month, at 6:00 p.m.
See the LISTING of our local officers. Unit history by Polly Frazier.